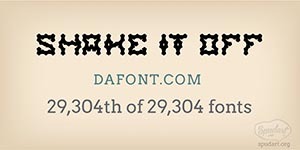 Google fonts, dafont.com, and other free font websites are such an incredible resource. All the fonts are available as either public domain, free, donation ware, shareware, or demo. As with user-submitted fonts, there can be some bad fonts. The sort by popularity feature on many of these sites is really handy to bring the best fonts up to the top. 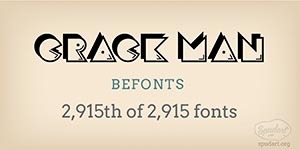 Let the thousands of users determine which are the most popular fonts by download count. Brilliant! Some of these fonts are absolutely amazing. I admire people who create fonts. It takes such time and dedication. Creating each letter, kerning all the letter combinations. A total of 92 characters makes for 8,464 kerning combinations between each character combination. Yipes! As you scroll through a particular font category, you can see how the top fonts are pretty good. But then page after page, you start getting into the “uhhh, land” where the designs get a bit sloppy or just strange. I find myself spending many late nights scrolling through the endless forest of crazy fonts. Sure, there are some pretty trees in this forest, but there are also some really scary trees. A fun thing to do is jump ahead to the very last page of results to see the least popular result. I challenge all designers out there to use one of these eight fonts in your next design. Creativity often comes through limits that challenge us. Take something that is considered not popular, and make something really great out of it. These fonts at the bottom of the list are currently unloved by the font community. Let’s bring some love to these neglected fonts. Discover a hidden quality of a forgotten font and shine a creative light to uplift the overlooked. Google fonts is arguably the most popular web fonts for website development. Among all the other free font websites out there, Google fonts gives a sense of professionalism and authority. But not all their fonts are going to be popular with designers. The least popular font in their roster is Ravi Prakash, created by Appaji Ambarisha Darbha, a type designer in Hyderabad, India. 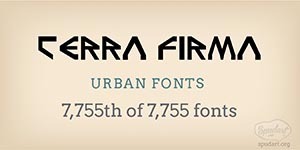 Darbha has created at least five other fonts which are available on fonts4free.net. They all utilized forms with thicks and thins with angles. The Ravi Prakash font has the most dramatic thicks and thins. Despite being the least popular font in Google’s roster, it has been performing better in the past few months. 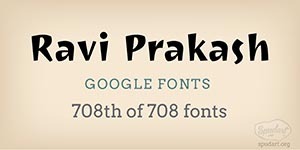 Google offers a statistics tab for each of their fonts that show the total number of times total number of times Ravi Prakash was served by the Google Font API. To view the last place font in Google fonts, you have to go to the Google fonts page; and scroll, scroll, scroll all the way down. Keep scrolling! And you’ll get to the last one. Designed by Dan Zadorozny of Iconian fonts in 2002. A Philadelphia native, now living in Texas, Dan has created over 350 fonts. A very nice bio sits on his website against a background of animated gif stars. I really do miss websites like Dan’s. This is the real internet. Some guy with a family that makes fonts at home as a hobby; and shares his creations with the world. While mostly techno/futuristic in style, I have recently delved into other styles, such as dingbats, comic book fonts, handwriting fonts and even historical looking fonts. For the most part, the fonts are basically geometrical – I create a “base glyph” with a certain look and feel and from that extrapolate most of the other characters. A fun fact about the name of his font foundry, Iconian, came from his AOL screenname in the 90s when he had an interest in icons. Dan’s website also includes a list of 1,613 potential words to use in acronyms for storyline organizations. 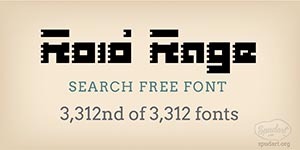 Of the 336 fonts he designed available on urbanfonts, the most popular is the Sci-fi Telemarines. To find the least popular font on urban fonts, simply go to the last past of results. Shake it off is a very… vibratey font. That combination of animals speaks to the nature of his font designs–A mishmash of geometric shapes. To see the current least popular font on dafont.com, it’s a bit tricky. Dafont doesn’t offer a master listing of all their fonts. Instead, they offer the rankings only within categories. Take dafont’s largest category, Fancy, and look at the last page of results for Fancy. We are starting to see that to have the least popular font on any free font website, it certainly helps to create a TON of fonts. 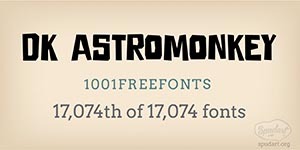 DK Astromonkey’s creator, Hanoded, has 240 fonts on 1001freefonts.com. Hanoded is a type foundry based in The Netherlands and run by David Kerkhoff. After finishing his journalism studies, David traveled extensively and ended up in Israel where he stayed for some years. David had a lot of jobs – zookeeper, goldsmith, artist and cook (to name a few), but settled on working as a tour guide and photographer. David specializes in handprinted typefaces and uses brushes, pens, ink and paint to create his fonts. He lives in a slightly dilapidated house with his wife, two kids, several Burmese Buddha statues and a mosque-shaped alarm clock from Oman. 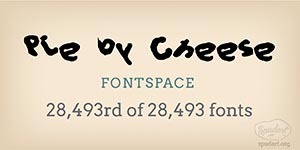 The last place fonts on 1001freefonts.com can be found by going to the last page of results. In my opinion, Nimbus Mono is actually a nice font. Mono fonts will always have weird spacing, because every letter is the exact same width. This ensures that the letter are mono-spaced, and will all line up on a grid. Nimbus also comes in a Sans face and a Serif face. The designer, URW++ is a font agency in Germany that creates custom fonts for corporations. In fact, on myfonts.com, URW++ sells . Their 5th best-selling font is Nimbus. Finding the least popular fonts on Font Squirrel is a bit tricky, as their popular list has no pagination at the bottom. When you scroll to the bottom of their 50 fonts, there’s nothing else to click. But by doing some playing around with their URL structure, I was able to find a way to get all their fonts listed by popularity. Here’s the last page of results. This font is so illegible, that I couldn’t just simply list it as “Pie”, because you can’t really read the p. If you are looking for a font that is completely messy, then maybe Pie would work. I’m imagining the designer’s 3-year-old child wrote these letters. The designer’s profile on Font Space is very confusing. His name is anuraghsundar, which I’m assuming is Anuragh Sundar. However, not much can be found online for Anuragh Sundar’s font career. The rest of his fonts are pretty much like Pie. I really want to be positive about everything, but Pie just leaves me wanting cake instead. Their site doesn’t allow you to sort all their fonts by popularity, but they do let you look at the fonts by year. The year with the most fonts on Font Space is 2013, so we go to the last page of results for 2013. Roid Rage is the type of font you’d expect to see at the bottom of font lists. It’s a complete mashup of several different styles of fonts. Some letters are very rectangular—to the point of being a bunch of squares, where other letters are all 70s swirly hypnotic style. If you are writing a ransom note, then Roid Rage would work very well. This font is designed by the same guy who did Terra Firma, Dan Zadorozny of Iconian fonts. SearchFreeFonts.com doesn’t have a master list of their fonts sorted by popularity, so use one of the larger categories to find the least-popular font. For this one, I used the decorative category. Ray describes this font as “Crack Man is an art deco style, counterless headliner with an early 1980’s video game slant.” Interesting that he sees it more as an art deco font, rather than the Pac-Man font. He’s probably trying to avoid copyright infringements. To get to the bottom of the barrel on befonts.com, head to their last page of results. Worm: Almost all the free font websites allow you to sort the fonts by popularity. A great feature to find popular fonts. Akora: You can also use it to find the least-popular fonts. On the free front website, click to the LAST PAGE of results, and download the last place font. 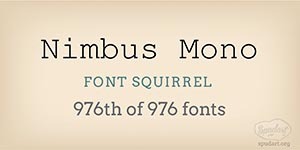 Rank: 708th of 708 fonts. Etym: Take the most unpopular font from a free font service, and try to design something with it!